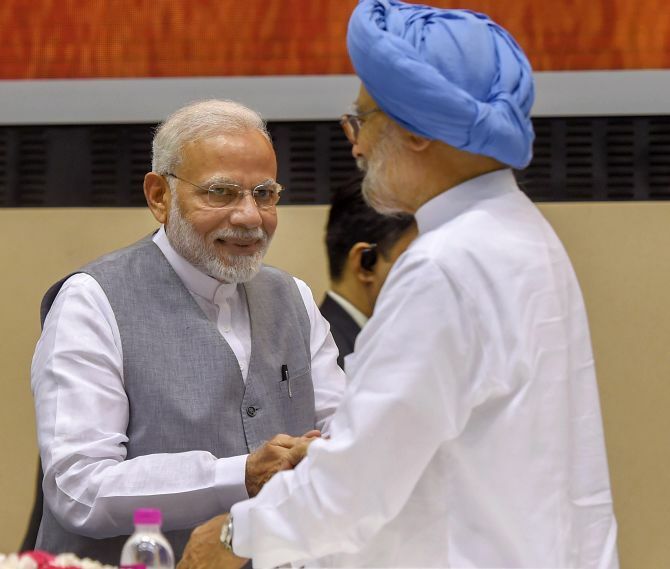 In a veiled jibe at the opposition, Prime Minister Narendra Modi said Sunday that by calling for discipline these days, one can be branded an “autocrat”, as he praised Vice President M Venkaiah Naidu for being a “disciplinarian”. 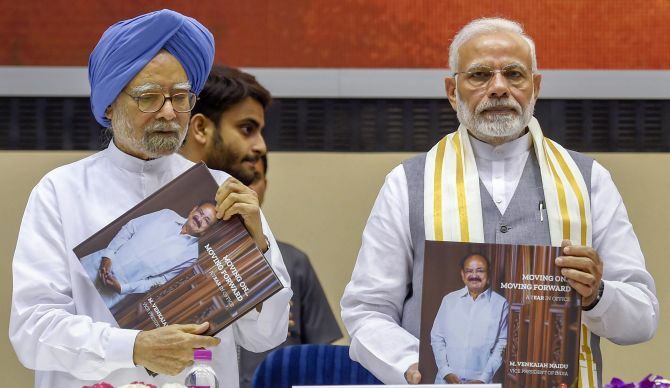 After launching a book on the vice president and Rajya Sabha chairman’s first year, Modi said Naidu always provides visionary leadership whenever he gets a responsibility. “Venkaiah ji is a disciplinarian, and the country’s situation is such that it has become easy to call discipline undemocratic. If one calls for some discipline, then that person is branded an autocrat... The whole dictionary is opened. But the discipline Venkaiah ji calls for, he himself follows it,” Modi said. Opposition parties were reportedly upset with Naidu for not allowing their parliamentarians to raise their issues of concern. The launch of the book ‘Moving on...Moving forward: A year in office’ was attended by Modi, former prime ministers -- Manmohan Singh and H D Deve Gowda, Lok Sabha Speaker Sumitra Mahajan, Finance Minister Arun Jaitley, Rajya Sabha’s Deputy Leader of Opposition Anand Sharma, and a host of other ministers, MPs and senior officials. Naidu, addressing the gathering, said discrimination on the basis of religion, caste or gender is unacceptable to any “nationalist” and this approach should be followed by everyone. He also called for deciding a national policy on the need for the Upper House in state legislatures, and urged political parties to evolve a consensus on the code of conduct for their members - both inside and outside legislatures. Modi described Naidu as a person “driven by a holistic vision aimed at improving the lot of common man”. He recalled that when former prime minister Atal Bihari Vajpayee was keen to offer to Naidu an important portfolio, he requested to be given the rural development ministry. 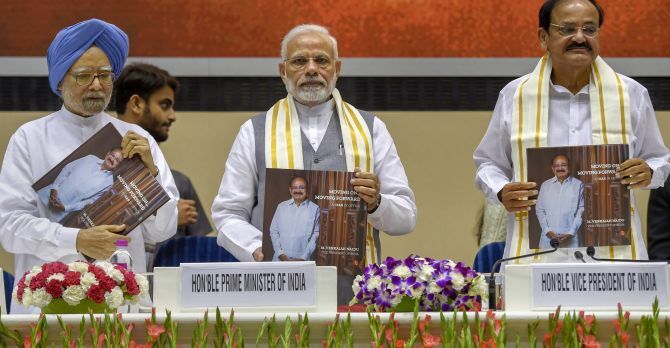 Modi noted that the prime minister’s Gram Sadak Yojana, launched by Naidu, became hugely popular among MPs, given the importance of rural roads. Referring to Naidu’s 50 years of public life, the prime minister said he has set high standards of discipline, commitment and passion to do justice to any responsibility given to him. Former prime minister Singh said the four themes that Naidu explored during his extensive travels in the last one year could become the national agenda to be pursued. “These include, untapped demographic dividend, an effective eco-system to ensure sustainable and remunerative agriculture, orienting scientific and research gains to improve quality of life of people, and enhancing public awareness about the country’s rich cultural heritage and harmonious world view,” he said. Mahajan said the book on Naidu’s first year in office was a chronicle of how a person from humble origins could rise to an exalted position and give effective leadership. Gowda said running the legislatures these days had become a lot more complicated and Naidu was doing his best in running Rajya Sabha by protecting the interests of all sections of the House. Modi said if the House functions normally, then nobody pays attention to who is sitting in the chair, but when the House does not run, then the focus is on the person who is in the chair. If the House would have been run properly then the vice president’s qualities would not have been manifested, he said. Modi also lauded Naidu’s oratorical skills, saying he has a way with words and is a wonderful speaker, in English or Telugu. “It is commendable that M Venkaiah Naidu Ji has presented a report card of sorts about his first year in office, containing the rich work he has done both inside and outside Parliament,” he said. “His (Naidu) desire, that the House functions well, there is a debate inside the House, those things come out of the House that help the country, this dream, will come true with his constant efforts,” Modi said. The 245-page book brings out Naidu’s “mission of engagement” on the four key issues with various stakeholders across the country and its alignment with the mission of a ‘New India’ in the making. There is a need to cleanse politics, strengthen parliamentary and governance institutions, give a big push to next level of reforms to harness the entrepreneurial and economic potential, harness the energies of young India, and ensure sustainable and remunerative agriculture, Naidu said.